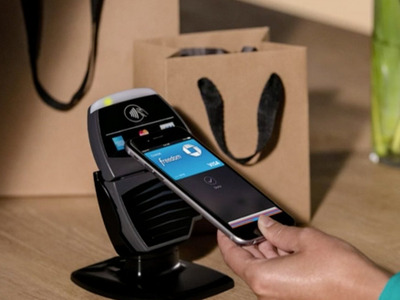 AppleTech-lovers love Apple Pay, but is that enough? Rurik Bradbury is CMO at Trustev, en e-commerce fraud protection company. We are republishing this post with his permission. Apple pulled off a very impressive move by launching an ultra-simple phone-powered wallet, while letting consumers keep their existing payment cards, at the same time as bringing onboard card networks and the banks that issue cards. The press is all over it, and tech-lovers have been very impressed with early results. In contrast, the retailer-driven CurrentC mobile wallet has been a fiasco. Starting with a PR disaster, when it had member companies Rite Aid and CVS pull support for Apple Pay, followed by scathing reviews in the press, such as Josh Constine’s in TechCrunch, which called it a “clunky attempt.” As an encore today, MCX, the consortium behind CurrentC, kicked off a second PR disaster by announcing it had been hacked. Ouch. MCX press conference was a total bust. BUT … before we write it off, there are some reasons to think again. Here are the main ones. This is a big one. By playing nice with everyone in the existing payments “stack,” like Visa, MasterCard, American Express, and the card-issuing banks like Chase and Citi, Apple is saddled with their same cost structure. Around 2% of any transaction gets split among those companies, with Apple getting a tiny slice as well. So with CurrentC that 2% is “in play” and merchants could rebate it back to customers as an incentive to adopt. For years the retailers have hated Visa, MasterCard, and American Express for what they see as a tax on their revenues. 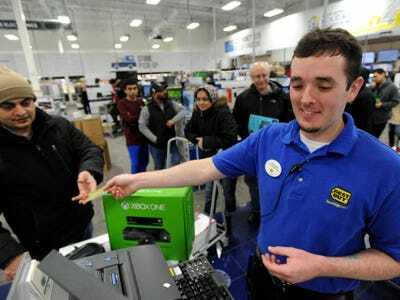 When the former CEO of Walmart (an MCX member) was asked why it would succeed, he said, “I don’t know that it will, and I don’t care. As long as Visa suffers.” For years, big retailers fought the card networks on multiple fronts to reduce fees, which they felt were extortion. They notched a big victory in 2012, with a $US6+ billion settlement, when they won their antitrust case against Visa and MasterCard for price-fixing. In the settlement, the retailers also got one of their most-hated stipulations removed from the card network/merchant agreements: that they couldn’t charge customers extra for using a credit card instead of another payment method (that means that merchants had to eat the card fees themselves, or lose the right to accept credit cards altogether. It was a very punitive clause). With this new agreement in place, retailers could now charge extra for using credit cards and Apple Pay, but less for CurrentC. AP Photo/David TulisMCX partners like Best Buy are blocking Apple Pay. Apple is not the upstart any more, it’s the huge gorilla, and with its vision and muscle, it has defined the way that multiple modern industries work. Retailers don’t want their payment systems to be Apple-owned, thank you very much. For consumers, Apple Pay has a number of privacy and security benefits: tokenized transactions; impossible to scrape or spoof; and anonymity for purchasers. But this is terrible news for merchants, who want — and highly value — any data they can get about their customers. They feel that Apple is locking them out of their own home. What might they pay for this valuable data? It depends on the industry, but many rewards schemes rebate 2% or 3% to customers in points or vouchers in exchange for engagement and data. So now the retailers have 4% or 5% of revenues to play with, as a sweetener to use CurrentC and not Apple Pay. That’s a lot. The number and dollar value of transactions going through MCX member companies is huge. Walmart, Best Buy, Gap, Target, CVS, and 45 others, making up a sizeable chunk of US retail spending. It’s not just a few holdouts resisting the Apple army. Tim Cook was hyping up Apple Pay at the WSJD Live event this week, boasting that over 1 million cards were added in the first three days. “Showing promise” says the more sober-minded Mike Isaac of the New York Times. More sceptical is Owen Thomas at ReadWrite, who calls out “breathless hype around Apple Pay” and points out how small that 1 million figure is, compared to the 600 million cards Apple has on file, and the 20 million Apple Pay-compatible devices sold to date. And those aren’t unique users, they’re unique cards (each user can add multiple cards if they like). For years, geeks have dreamed of ditching their ancient magnetic strip cards and paying with their phones. Google Wallet failed, and Apple Pay is off to a slow start — even with its massive leap in usability versus older systems. Could it be that regular consumers don’t care that much? That swiping a card is not very difficult or inconvenient? And, sure, Apple Pay is more secure and private, but consumers generally aren’t on the hook for credit card fraud, so they don’t care so much about that, either. While techies are making fun of the ugliness of the CurrentC experience (QR codes! Are you kidding me? ), most people care about money and savings more than slight inconveniences. Several days per week I get a salad from Sweetgreen (a delicious salad place, FYI), which I order online and pay for with their app, which uses … a QR code. It’s less convenient than Apple Pay (which I have also used from day one, by the way, lest you think I’m a hater) but it also serves as a loyalty card and gives me free salads every so often. Exactly like CurrentC. Now imagine an app like Sweetgreen’s that works in most places you shop, and gets you rebates of 4% or 5%. Apple Pay still look quite so appealing?